A few years ago I was invited to a high school in St. Stephen for a Trades & Tech Gala for Girls. I was able to chat with Grade 12 students about potential careers and even got to pitch my own career to them! In case I don’t make it obvious – I’m a Civil Engineer. I work for a consulting firm in Saint John. I spend my days with developers – getting plans approved, preparing drawings, costs estimates and specifications. From time to time I get to visit job sites where I confirm the vision I had on paper is translating to real life just as I had imagined. Events like the Trades & Tech Trade Show make me realize how lucky I am to be in a role where I go to work everyday, get to use my brain, my developed skills and the knowledge gained from Post Secondary Education. I take for granted quite often that I work in a male dominated field (only more obvious as I type this at a Water & Wastewater Conference). 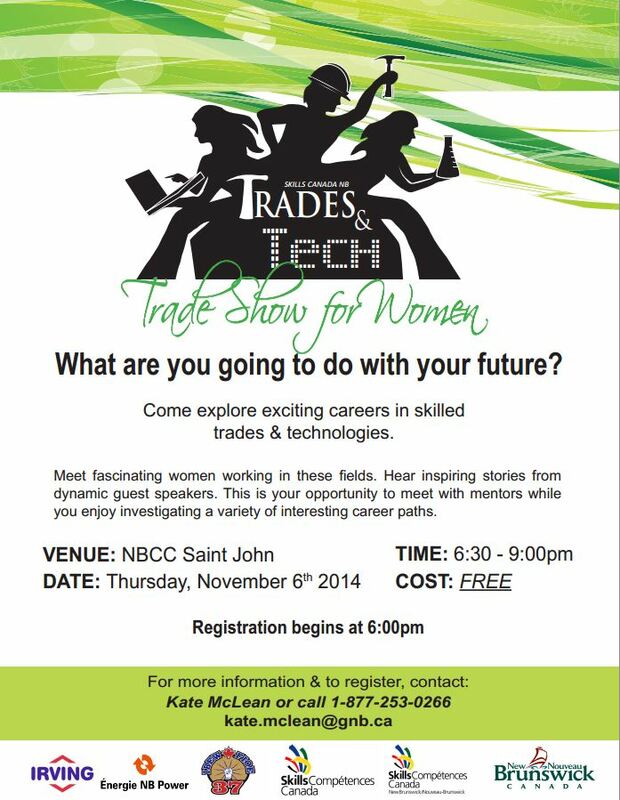 On November 6th, The New Brunswick Women’s Equality Branch invites you to join them at NBCC Saint John another Trades & Tech show. It’s your opportunity to explore “non-traditional” careers, career changes or opportunities.